Landscaping with color adds to our enjoyment out by the pool. Our guests enjoy it as well. We try to have something colorful blossoming through out the summer. 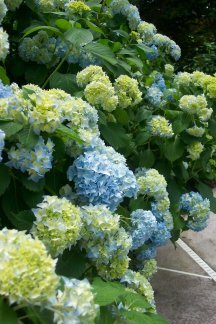 Our yard is best known for our beautiful hydrangeas. We have pink, blue, purple and lime green blossoms. The Nikko blues start blossoming in May and the Pee Gee Limelights start their show in mid-July. Not only do they provide colorful landscaping, but the blossoms make the most beautiful floral arrangements as well. These beauties are easy to maintain. Some years I fertilize them and other years I don't. What they love best is lots of water and some shade to protect them from the harsh sun. 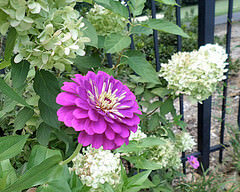 We prefer the low maintenance of perennials rather than planting annuals every spring. 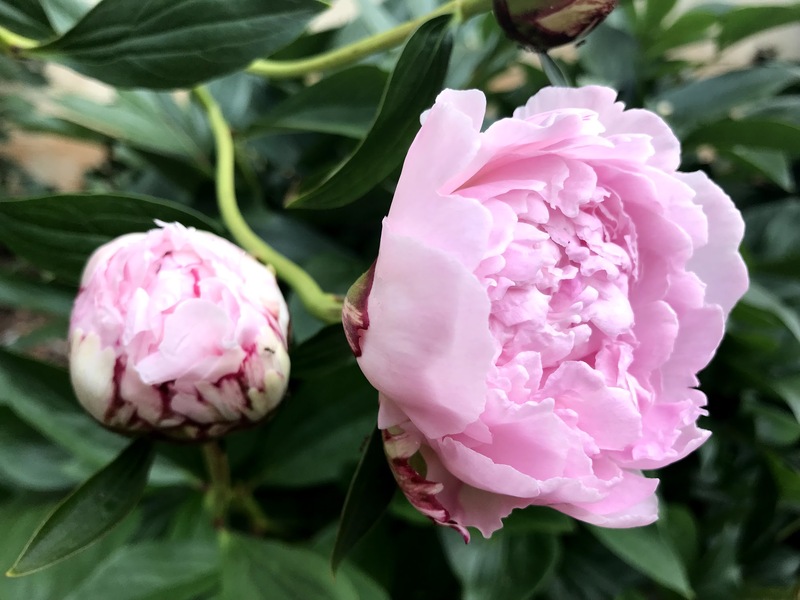 Starting with our pink peonies in April followed by our yellow Stella de Ora day lillies in May and red hibiscus in June. These plants faithfully come up every year. Many of them can be divided and added to other areas around the pool. We make beautiful bouquets of peonies and hydrangeas to use as centerpieces for our enjoyment and when we are entertaining. I love the large blossoms of this perennial, Rudbeckia fulgida ‘Goldsturm’. Not to be confused with the smaller blossomed, Black-eyed Susan. They love the full sun but can take some partial shade. They came up for about 3 years and then needed to be replaced. 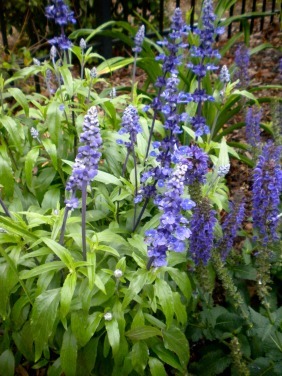 Salvia pratensis ‘Indigo’ also known as Meadow Sage is a wonderful repeat performer. It also likes full sun and tolerates the heat. Hummingbirds and butterflies are attracted to these tall purple blossoms. 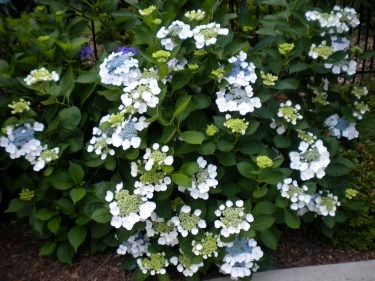 Lace cap hydrangeas are just one of the many different hydrangeas growing in our yard. We keep these inside the pool fence because the deer love to feast on them. They like early morning sun and shade in the afternoon. 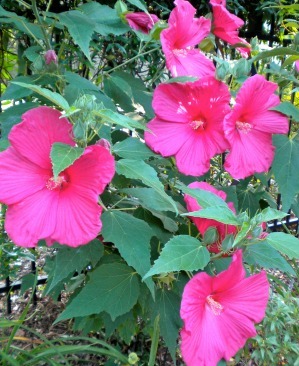 Unlike tropical hibiscus bushes which we enjoyed when we lived in Miami, perennial hibiscus will come back year after year. The huge blossoms - ours were about 10" wide - make a big splash of color. These plants will die back to ground during the winter are rather slow about showing up in the spring. So be patient. 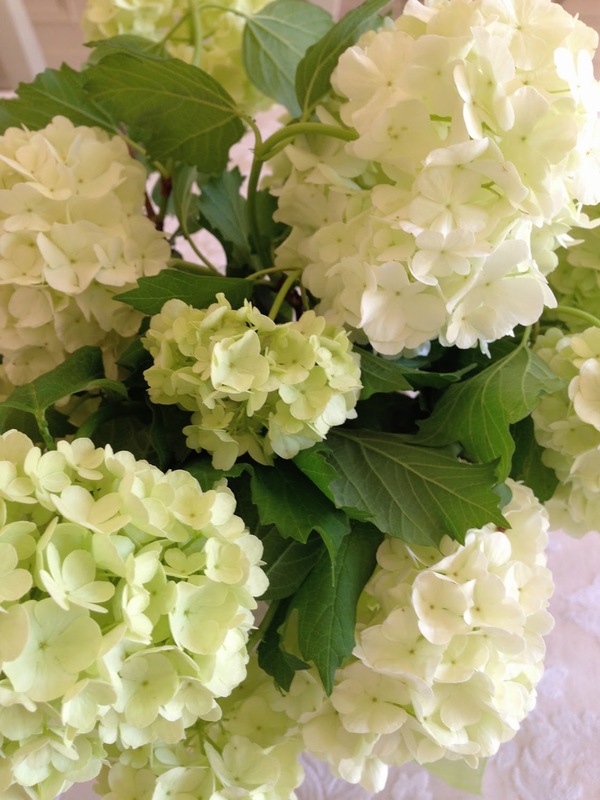 I can't get enough of these PeeGee Limelight hydrangeas. 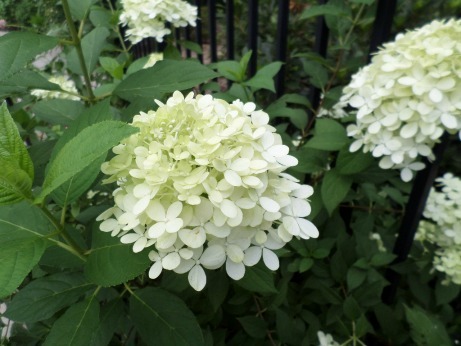 When all of my other hydrangeas have finished blooming these plants show up with lime green blossoms that turn to white and then fades to shades of pink. The blossoms are so perfect looking - no blemishes, no brown spots - just beautiful petals of white. 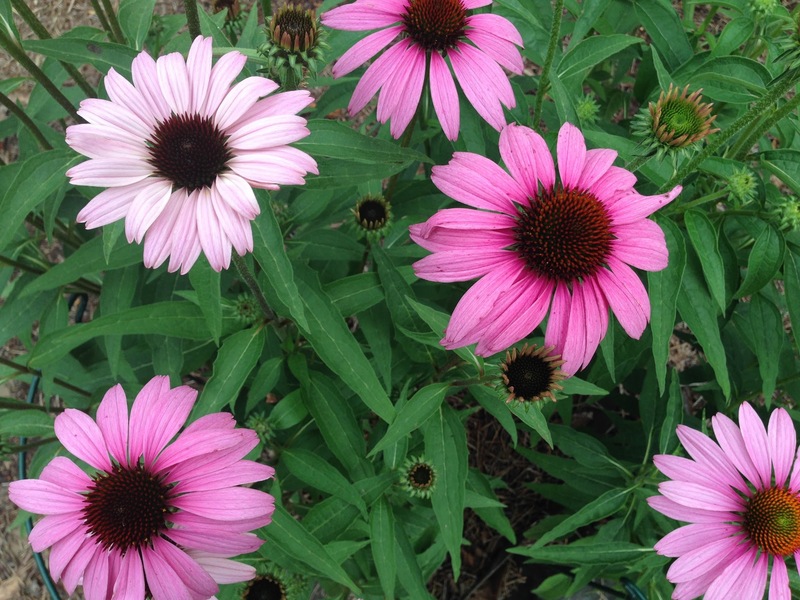 Pink coneflowers are a perennial that not only come up every spring, but unlike many other perennials they blossom all summer. These plants make for great cut flowers for bouquets. This smaller variety of gardenia is called Radicans. Because it is slow growing it doesn't require much pruning. It only reaches 24 to 36 inches in height. The smaller flowers are about 2-3". 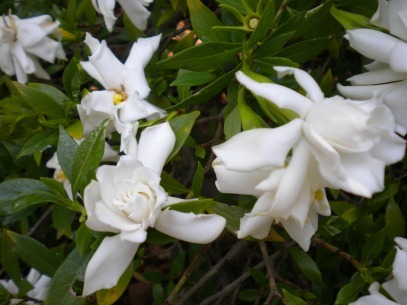 Gardenia Radicans is blooms later than the larger varieties and gives off a sweet romantic fragrance. We had a professional landscaper draw up a landscape plan when we first put in our swimming pool and planted many of the bushes that he recommended. We have since taken those said plants - like holly bushes. Why would anyone want holly bushes around their pool - yes they provide greenery in the winter - but these bushes are so prickly that it hurts to trim them or get near them. Plus they send up new shoots that need to be dug out which makes them not only high maintenance but unpleasant to maintain. We've planted low growing repeat blooming azaleas around the pool fence that give us quite a show of color in early spring. 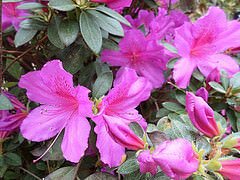 However there are different varieties, such as the Encore azaleas that blossom again in late summer. This April blooming bush (in Georgia) provides lots of shades of white and pale lime green flowers, making it a great bush to have for cut flowers in the house. Include color on the pool fence by planting vines that blossom through the summer. 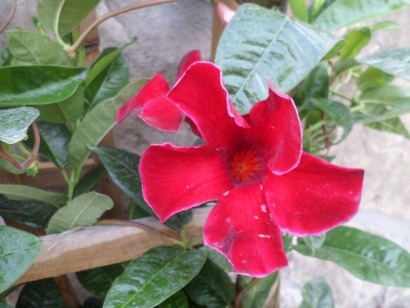 Flowering vines, like mandavilla, clematis or jasmine also bring color to the pool area - but with little maintenance. Two years ago we planted a new wisteria that hopefully will blossom this year. 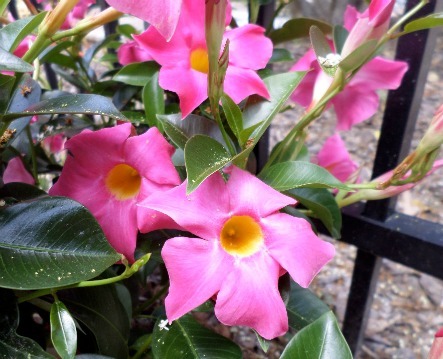 Mandavilla vines come in a variety of colors - white, pink, yellow and red. They only last for the summer - but they also blossom all spring, summer and fall until it frosts. Our favorite is the red Giant Crimson Mandavilla. They are annuals and need to be replaced every year - but the continual buds make them worth the extra expense. 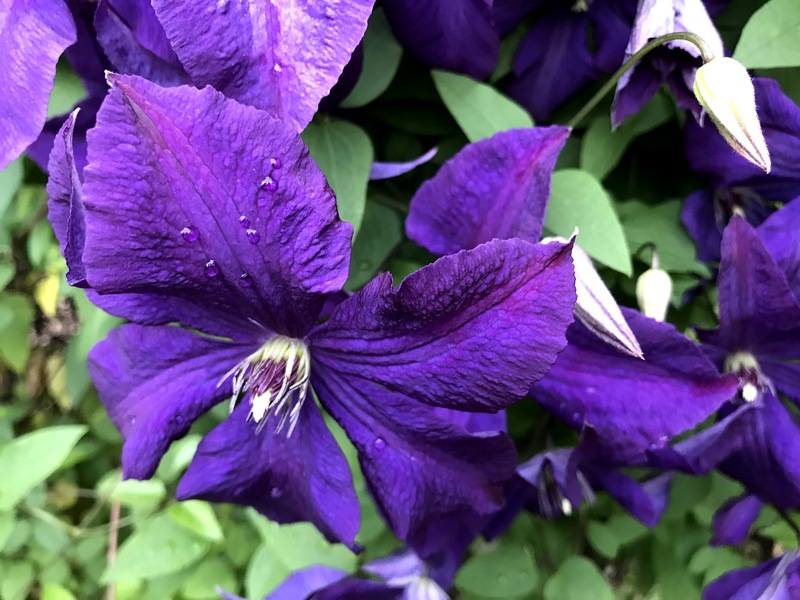 Clematis vines also come in a variety of colors and sizes. This Jackmanii clematis comes back strong every year giving us a show of purple blossoms all over our pool fence. Confederate Jasmine cover one side of our pool fence. 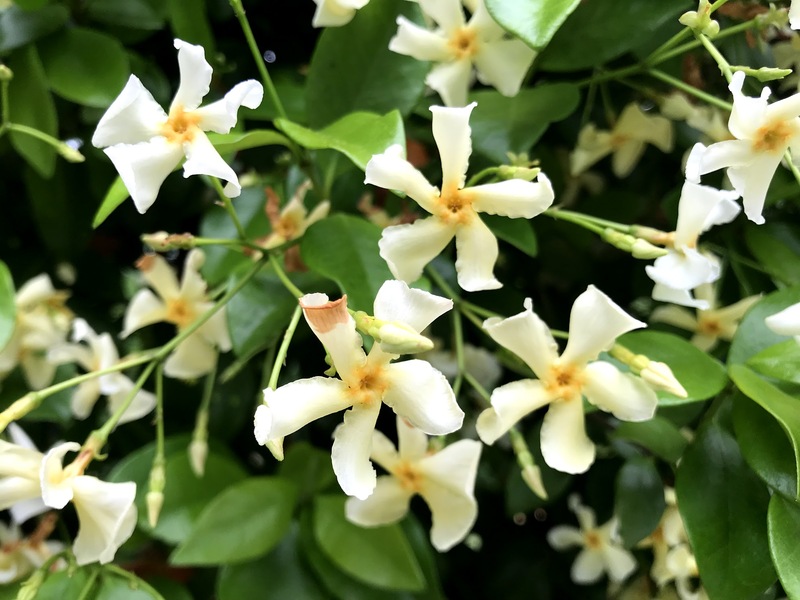 In June the fragrance of this small white blossoms pervade the pool area. Lantana have always had a place around our pool. Living in the southeast we use plants that love the sun and heat. These plants even like drought. Depending on how severe the winter is, they may or may not come back for another season. 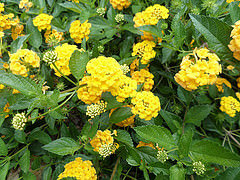 Plants that will blossom all summer are the best - and Lantana do just that. They grow fast and are soon draping over the stone wall by the pool providing a fresh burst of color all summer long. 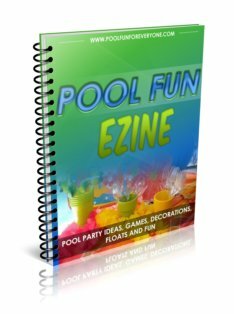 Our pool will never be without zinnias again. 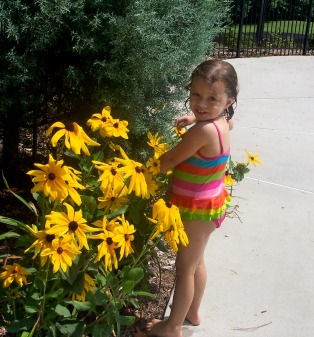 I planted several packets of seeds around the pool and we have flowers in every color of the rainbow from orange and yellow to pink and purple. 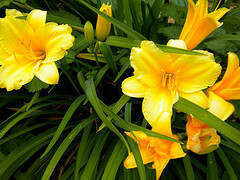 They blossom all summer long giving lots of bright color. 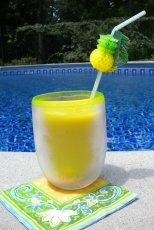 There is always a fresh bouquet of flowers in my kitchen and as I look out to the pool I often see hummingbirds and yellow finches enjoying them too. 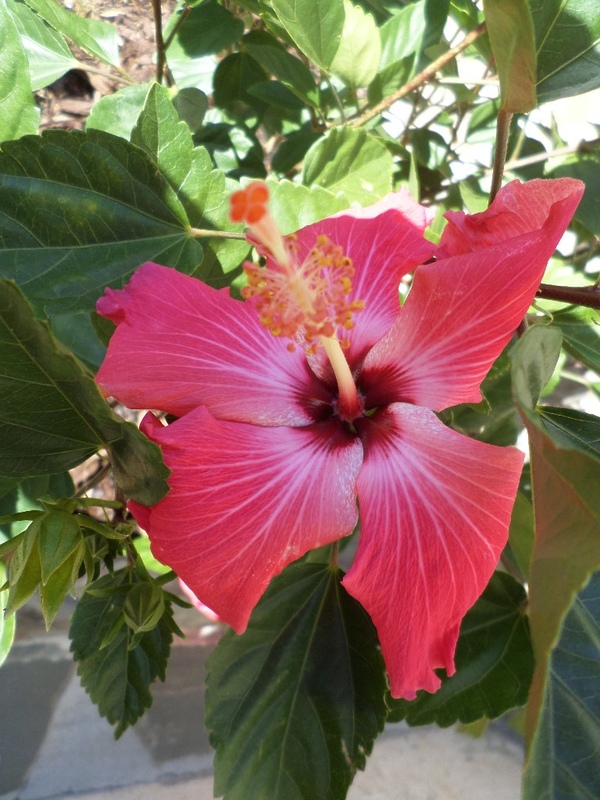 Tropical plants like hibiscus bloom all summer. The large beautiful petals put on quite a show. Colors range from pink and red to yellow and peach. They can be planted in the ground - where they don't dry out quite as quickly or in a pot. These plants only last for the summer unless you bring them inside for the winter. I've been using Bill's organic bloom fertilizer for over a year and will continue to use it. 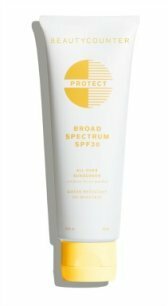 I love how simple it is - simply spray it onto your plant leaves. No sprinkling dry granules around the base of the plant and then scratching the ground to move leaves, pine straw or mulch to make sure they absorb into the soil. My husband commented several times how much bigger, better and more prolific our garden blooms were last summer - and I know it wasn't because of better weather or more rain.